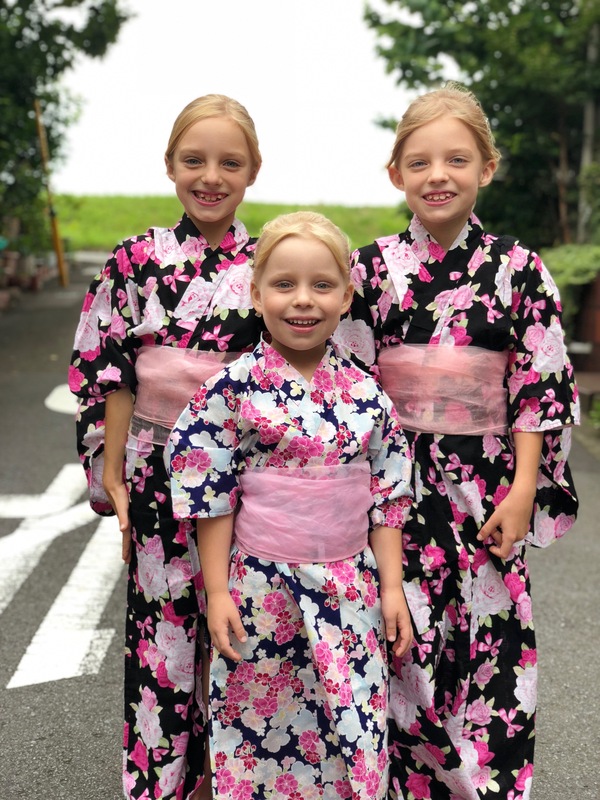 It’s summertime in Japan — which means summer festivals with dancing and fireworks (Matsuri 祭り), Yukatas (the traditional Japanese summer wear 浴衣) and fun Japanese food. This year was Sarah’s first year to dance, and she was so excited! To add to the excitement Sarah turned 5 years old the week before, so we invited her Japanese classmates to come to our house for an American birthday party — and they all came! We shattered the record of people in our house at once, you’ve just got to see the video below! And this last picture I just had to include — it was only 3 years ago that Becca & Anna were dancing in this summer festival, and now it’s Sarah’s turn! Wow time flies — but they all look beautiful together!